I have found the cure to the black dog of depression is to get a little 'I won't stand for any nonsense' white one. Lots of bad dreams last night. 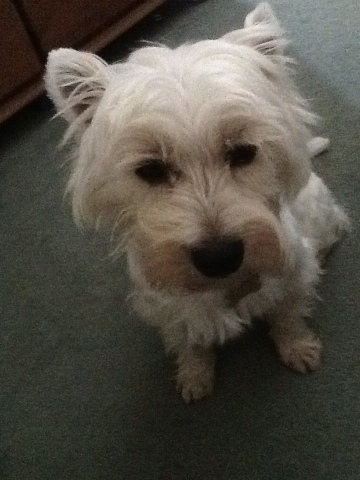 I must make sounds or something because my little West Highland Terrier decided I needed waking up. He sometimes bites my big toe to bring me back to reality, but this morning it was a cold black nose pushed under my bottom and lots of snuffs and snorting. I tried to have a sniff and feel sorry for myself, but a warning nip stopped the tears straight away. Once I'm finally awake I get a minutes cuddle and then that's it. He sits grumbling by the bed while I write my blog. He will not be happy until I'm up and dressed. He often brings me my knickers and a sock into the bathroom just to make sure that I don't sneak back to bed for a lie in. I may be writing in bed but there is no way I will be allowed any more sleep! So feeling sluggish, slightly nauseous and bullied from a small dog it was time to decide what to do. It's my writing group first thing. I was pleased by a message that one of my talented members who doesn't have a great deal of confidence about writing had actually submitted some work, and decided to read at The Groundlings Theatre event. It does as they say make everything worth while. A bit of reflection next. It's not been a bad week. I've had some nice quality time with the kids. Done some writing and submitted lots of work. Not been a great week on the healthy eating front and very little exercise. Been to the theatre and had a meal with friends which I'm thankful about. Next I decided I to look at my targets for the coming week. My latest education resource must be finished. The calendar for next week has some nice events. I'm looking forward to William Sutton and Diana Bretherick book launch on the 31st at 16:30 at Blackwells. It's the Southsea Show on Saturday and I will be reading with Maggie Sawkins and the Tongues and Grooves crowd - lovely. Hoping to catch up with friends for drinks. It should be nice and relaxed. I have decided that now it's cooler it is time - big sigh - to go back to the gym. But I make that promise every morning. And now it is time to get up and face the day. My little doggy is making some big noises and he will nip if I try to lie here any longer.